Words and Photography by Jethro Manuel. It’s one thing being part of a ‘cultural’ tour in a South African township, however it’s a true honour and privilege to be part of the first group or should I say ‘Guinea pigs’ of a township tour of Alexandra. Alexandra, more popularly known as Alex, is a township situated in the city of Johannesburg and is located just 5km east of the corporate behemoth and traffic-congested Sandton CBD. 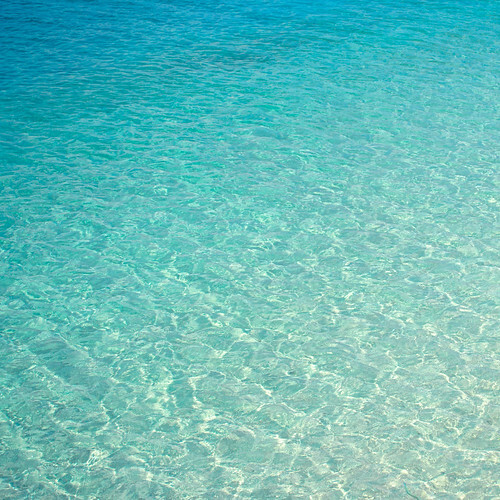 Alex was established in 1912 on land originally owned by a farmer called Mr Papenfus who named it after his wife Alexandra. His goal was to establish a ‘white’ residential suburb, however, due to numerous factors, it was shortly proclaimed a ‘native township’. Fast track to 2016, I am on a first of its kind tour of this township which according to the most recent censes, has a population of approximately 180 000 people squashed into a tiny area of just 6.71km² (26 000 people per km²). So it’s easy to see how road and people congestion have become the norm (I can still hear the constant ‘hooting’ of motor vehicles and taxi’s in my subconscious). Established in 1919, this church is located on the corner of 1st Avenue and Rev. Sam Buti Street. It hosts weekday masses and devotions; Sunday holy masses and confessions facilities. 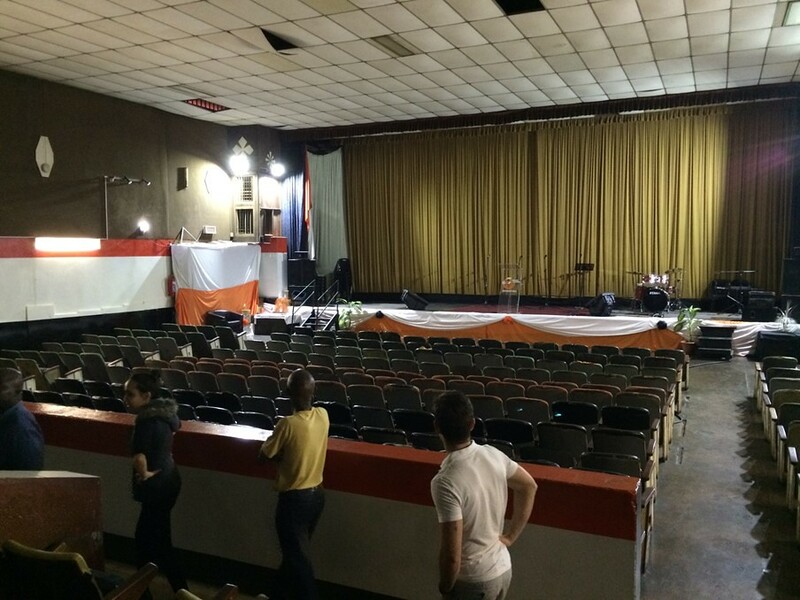 It’s very popular amongst the local Catholics and also has sentimental value to the older generation as it was once used as an underground meeting venue for banned ANC meetings during the Apartheid era. The church property also houses The Joseph Gerard Home for the Aged which provides accommodation, food and healthcare for the elderly. A walk through the church and old age home provided us with a view of hardship for the elderly yet hope provided for by the Church. Built in the 1950’s, Kings Cinema is an ‘art-deco’ movie house that was once the busiest cinema in Alex. From the outside, the square face building appears no less intriguing than a local grocer or corner spaza shop with peeling movie posters of yesteryear on the walls outside. This continues as you step inside with kids playing arcade games and somewhat of a dead-end feel once you’re 5 metres in. This anomaly soon disappears as you walk through inconspicuous double doors into a magnificent open theatre which seems to be hiding itself to protect its beauty. There are well over 400 seats and the venue is currently being rented out to various churches and hosts local musicians and bands. 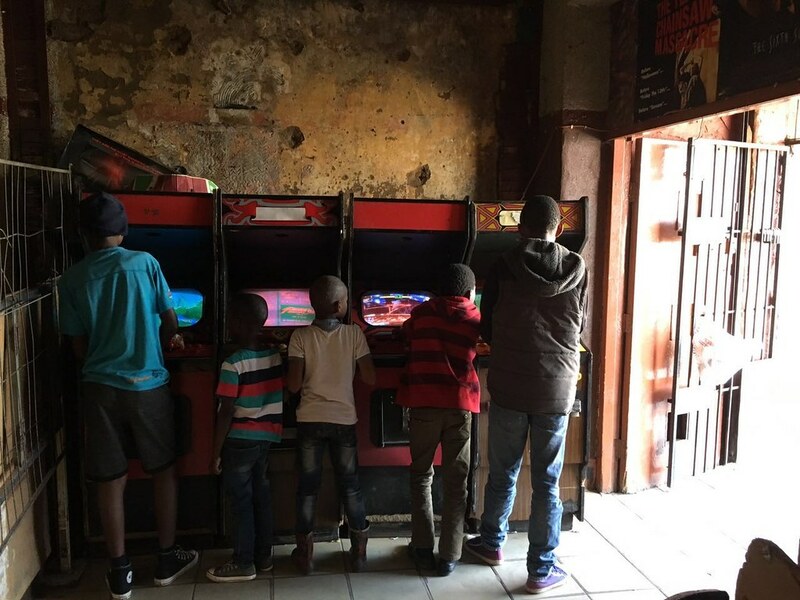 Kids enjoying arcade games at the entrance of Kings Cinema. 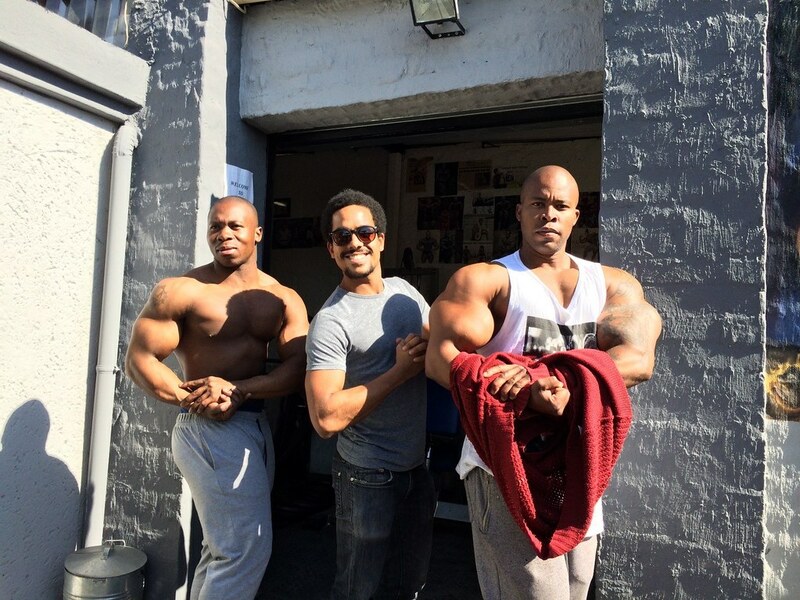 Ikasi Gym is located on Richard Baloyi Street and is owned by SA champion body builder Tumi Masite. Tumi started training under the mentorship of Reg Park (3 times Mr. Universe winner) and transformed part of his home to accommodate his gym where pumping iron and throwing weights around seems to be the order of the day (Masite biceps are larger than my head which is a cause for concern). 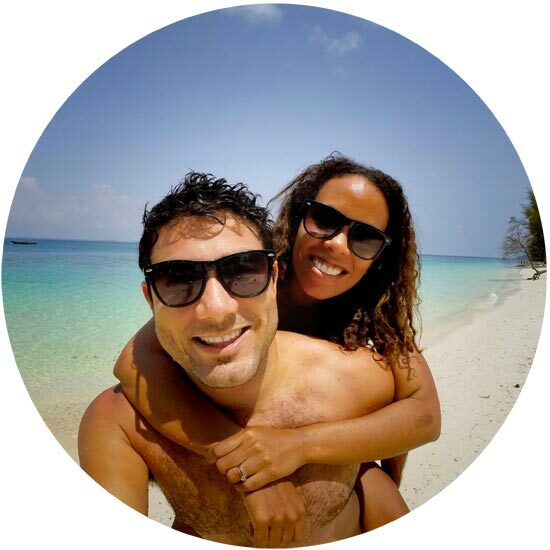 The gym is small and narrow, yet packed full of bars, dumbbells, boxing bags, weight lifting machines as well as newspaper clippings of inspirational body building figures such as Arnold Schwarzenegger, Kai Green and Masite himself. Masite and his trainers promote an active and healthy lifestyle and have transformed the gym into a symbol of strength in the township whereby they offer boxing, body building, arm wrestling, weightlifting, aerobics, yoga and physiotherapy. In addition to Masite having an impressive body building cv complete with medals, trophies and stories of competing in Japan, he is also a self-proclaimed artist and does canvas paintings which are for sale in the gym. A man of diverse talents you might say! The author, Jethro Manuel, in between Tumi Masite and a fellow trainee. Mandela’s Place (46 7th avenue). 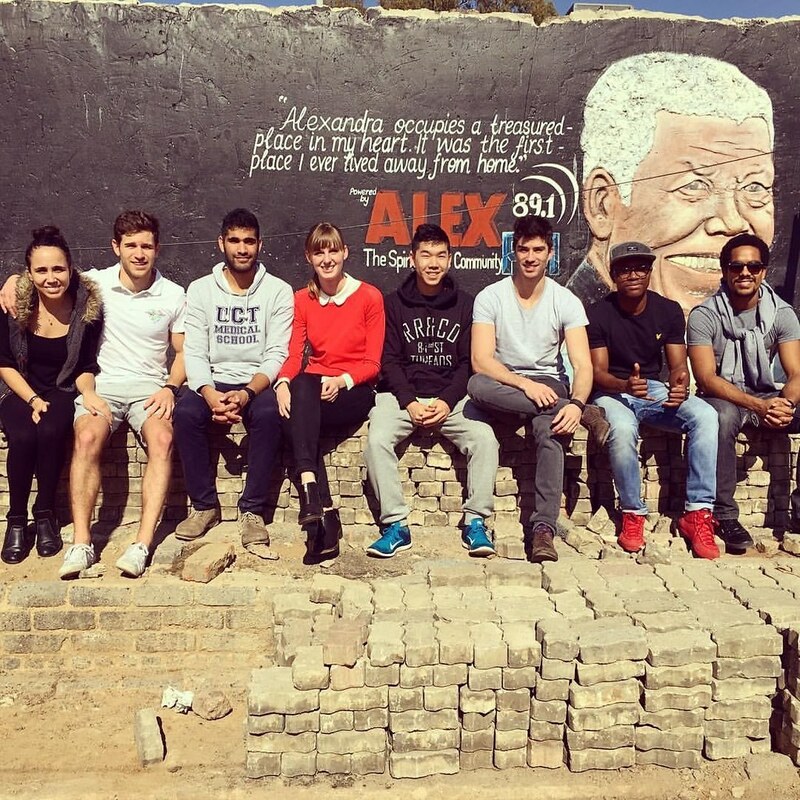 Orlando Soweto is famous for being the home of the father of our nation, Nelson Rolihlahla Mandela. With that said, many people do not know that Alexandra was actually his 1st place of residence when he 1st relocated to Johannesburg from the Eastern Cape in 1941. Mandela’s Place which is an Alexandra Heritage Site is a single back room attached to a house owned by the Xhomo family for generations. Tata Madiba rented this room when he worked as an article clerk with attorneys Witkin, Sidelsky and Eidelman while completing his BA at the University of South Africa (Unisa). Alex- Nelson Mandela’s first place of residence after relocating to Johannesburg in 1941. Phuthaditjaba Community Centre was started by philanthropist and local businessman Linda Twala. A very well – known community worker, activist and member of Habitat of Humanity, Linda has been recognised for his countless contributions to the community. This is clearly seen by his wall of fame which includes numerous awards, certificates and photos of him in Alex with Nelson Mandela, Richard Branson, Bill Clinton and even the Queen of England (#impressive). Linda has always been a community activist, however, it all changed when at the height of the anti-apartheid struggle in 1986, security police bombed his house in 17th Street. His three daughters were in the house at the time but they managed to escape with help from neighbours. Everything was destroyed, his house, car, dog and even his clothing. Luckily a few elderly ladies from the community brought him some clothing so he had something to wear. This act of kindness has stayed with him as he’s spent his life caring for the elderly and continues to pay it forward. 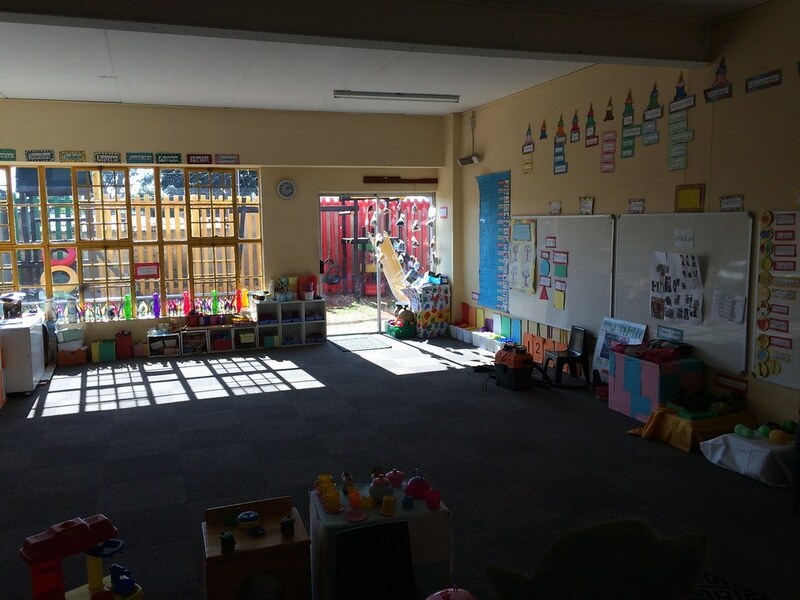 Phuthaditjaba Community Centre includes various projects such as Care of the Aged; The Ronnie & Rhona Lubner Child and Youth Care Centre as well as the Afrika Tikkun Child and Development Programme. This is a beacon of hope in the midst of poverty, inequality and unemployment which is rife in Alex. You can’t go into a township and not have a pit stop at a local shebeen. Chicken, Wors, Pap and Chakalaka is the name of the game with an alcoholic beverage to add some flavour. Oh and please don’t even think about your own plate, serviettes or glasses. These are not authentic! 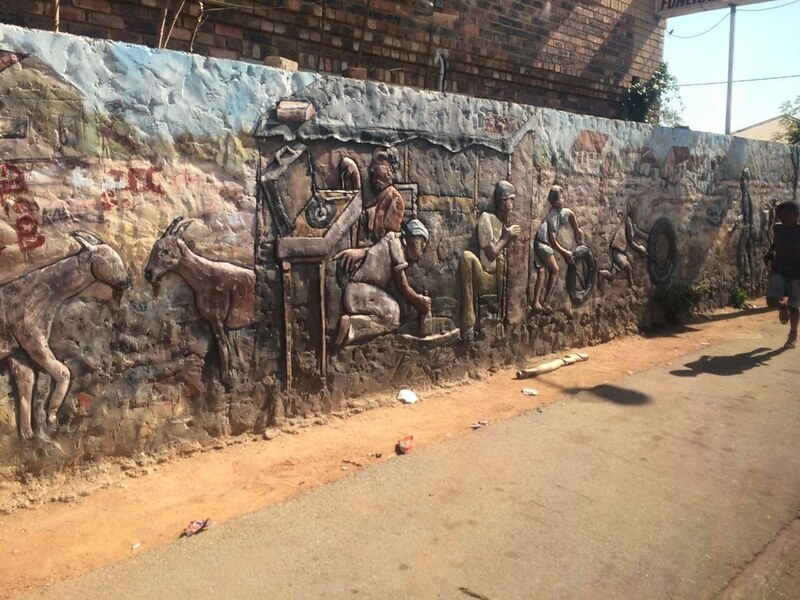 Murals on the wall outside a shebeen in Alex. We were on our way to a local eatery and bar which is more commonly known as a ‘shebeen’, when we were confronted by gridlocked traffic. We stumbled upon an event of epic proportions and immediately jumped out of the taxi. 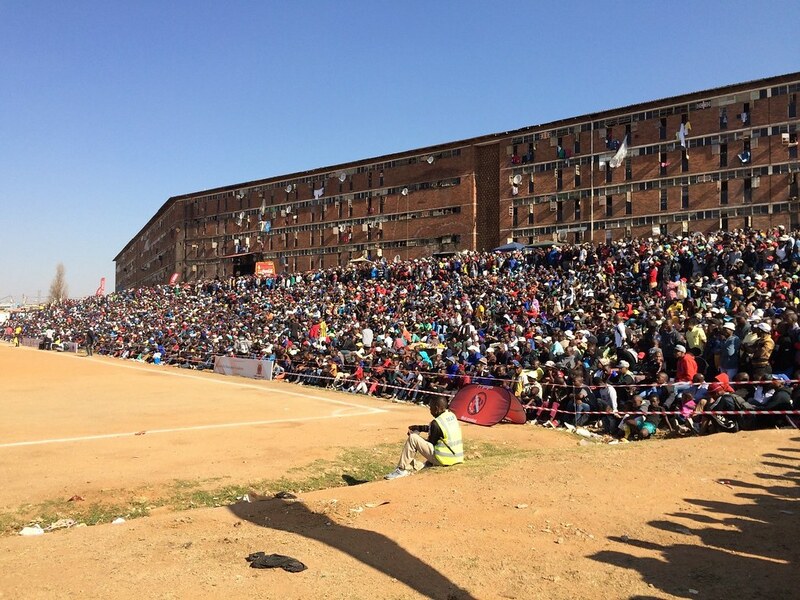 It was a soccer match being played under the auspices of the MAP Games; an annual amateur football and netball festival based in Alex. It was started as a social responsibility project by local resident and soccer star Maimane Alfred Phiri who was capped 10 times for Bafana Bafana and represented South Africa at the Soccer World Cup in France in 1998. It was like any other sporting event just without a concrete stadium to formalise the proceedings. The crowd sat in orderly rows whilst being served by vendors. VIP areas were abuzz with gazebos, food stalls and drink stations were aplenty; and marshals kept the crowd in check. The most fascinating feature of the few minutes we watched, was the fact that the players didn’t seem interested in scoring goals, but rather to ‘Diski’ or outskill their opposing player. At every instance of this, the crowd went wild. I felt like a foreigner in my own country. As soon as we managed to get a clear view of the match being played I started taking the proverbial photos and video clips. At that moment, I turned to my left and saw that our group was being photographed in return. This made me realise that the presence of both parties was inherently fascinating to one another. We were separated by income inequality, yet our innate human instinct of interest in one another was prevalent and most importantly… welcoming. Watching a soccer match in the heart of Alex. For more info on these tours, contact Jimmy at alex.tours.sa@gmail.com or call +27 836774601.